(NaturalNews) Garlic has been used for thousands of years all over the world, and modern science is now backing up its medicinal properties. 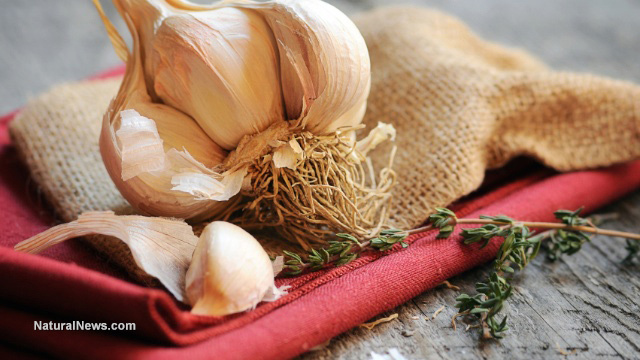 A recent study by researchers at Washington University has found that garlic can be up to 100 times as effective at treating bacterial infections as most mainstream antibiotics, as reported by Natural News. Chop tops off garlic and coat in olive oil. Chop thyme, parsley and bread. Preheat the oven to 180 decrees. Wrap garlic bulbs in tinfoil and bake for an hour and a half. Then allow the garlic time to cool. Heat two tablespoons of olive oil and butter in a pot on medium heat. Add onions and cook for ten minutes. Once garlic has cooled, mash it with a fork and add to the pot. Then add herbs and chicken broth. Cook on low before adding bread and cooking for five more minutes until bread cubes soften. Pour into a blender and process until smooth. Add sour cream, salt and pepper to taste – then serve and enjoy!